I am looking to tour SPELLBOUND this coming autumn 2019, so if you would like to see the show at your venue or town, get in touch! (See ‘Solo shows’ page for details. 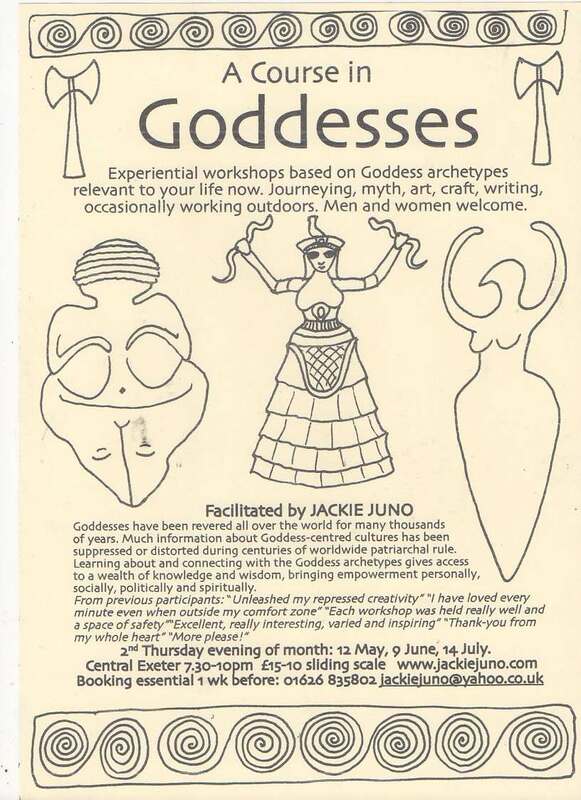 Each month we work with a different goddess archetype, using shamanic journeying, discussion, writing, art, craft and ritual. Profound, moving, life-changing work. Booking and deposit essential. £15 for the evening. Concessions available for those on a low income. Small groups. BRIXHAM: Monday 25 February 7.30-10pm. In beautiful private house. Seven places only. CHAGFORD: Wednesday 27 February 7.30-10pm in magical house on the edge of the wild moor! Strictly five places only. OUTSPOKEN! POETRY OPEN MIC IN CHAGFORD upstairs at the Globe Inn. Lovely candlelit space with squishy sofas. Every first Wednesday of the month.